One day, Michele lost her hearing. The medical profession could find no reason. Four years later, her hearing returned, again spontaneously. Without one word of pontification or explanation, she makes the reason clear, but I won’t tell you what it is. She achieves a seamless interweaving of three time lines: A trip to Antarctica with her second husband, Gordon, showing the new Michele; the years of her deafness, during a marriage neither she nor her husband realised at the time to have been severely abusive; and flashbacks to significant, mostly traumatic memories of her childhood. This is very powerful. She not only gets the reader into her emotional world, but without explaining, shows where the pain came from. If I were still seeing clients as a psychotherapist, I’d put this book on their reading list. But it’s also an enjoyable read. Michele Susan Brown did a fantastic job of building this story for her readers. 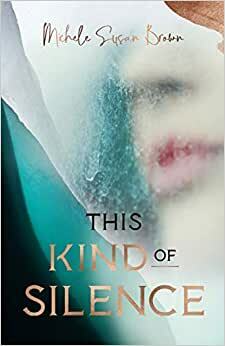 ‘This Kind of Silence’ shows beautifully how Michele learned to listen when she suddenly lost her ability to hear. I read the second half in one sitting because I was so intrigued to turn the pages and see how her journey unfolded. To me, it read like the script of a captivating movie. Her story is an inspirational one which expresses how we have more control over our thoughts and our bodies, than we probably ever imagined. It is a story for everyone and I know I will read this book many times over, as there is so much wisdom and hope contained within the pages. First, I want to thank Michele Susan Brown and The Nonfiction Awards for providing me with this book so I may bring you this review. I commend Michele Susan Brown for being incredibly brave and sharing her deeply personal story with her readers in This Kind of Silence. Through this book you will see many sides of Michele as she goes through her journey of finding herself after hearing loss. One thing is for sure she is stronger person for going through this. Michele has a gift for writing with passionate, compassionate emotions behind the characters in particular scenes. Many of these scenes my heart strings were pulled on hard! Whomever designed this book cover did an amazing job. I thought it was the most beautiful book cover I have seen in ages!! There is a beautiful letter to the reader in this book. This has been a dream of Michele’s of 5 years to make this book a reality!